Preheat oven to 400 degrees. Place both sides of the baguette on a cookie sheet with the crust side down and the cut side up. 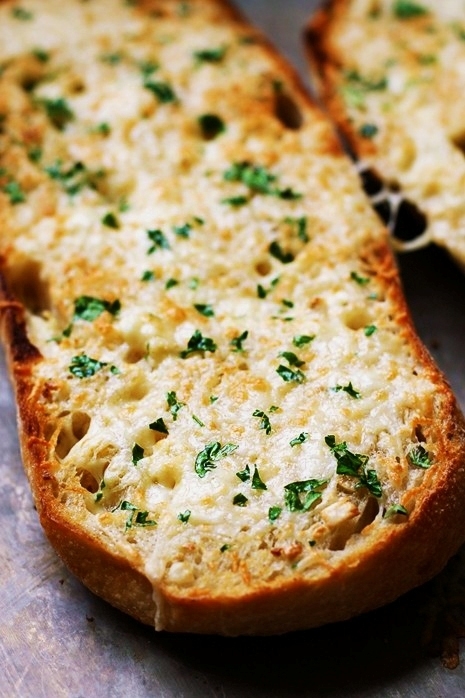 In a small bowl, combine butter and garlic and spread evenly on baguette halves. Be sure to press the garlic butter down with the back of a spatula or spoon so the small pieces of garlic are pushed into the air pockets of the bread. Bake bread for 15 minutes and remove from oven. Change the oven setting to high broil. Evenly sprinkle cheese over the halves of bread and stick the cookie sheet back in the oven. Broil for 1 minute or until cheese has completed melted and shows a few golden bubble marks. Remove from oven and carefully slice bread in diagonal pieces and serve. Store remaining slices of bread in the freezer in a ziplock bag to use in the future.